Writer: Jayati Mukherjee – a Solo-preneur, LnD Enthusiast, Career Coach, Certified Talent Management & Emotional Intelligence Professional, with more than 15+ yrs. of organizational experience with varied scope. Business Case Background: ABC Limited is one of the leading companies in the Indo-Italian Agro food sector, an innovative company and an industry benchmark for meat processing. The turnover of the company in the year 2011 was over 2 billion Euros. Founded about 40 years ago, the company relies on collaboration with over 6000 workers and has industrial plants, subsidiaries and branches all over India. The company ABC Limited is subject to intense market pressure which requires constant innovation. An internal analysis led the Sr. Leadership to focus on people management & development as a strategic priority. The HR Dept. was charged with leading transformation. HR Director made a statement as below: “Manager, in particular, considered the renewal a business priority in order to achieve tighter integration among different business areas, better communication process and sharing of information and mainly support management growth in terms of development of the personnel”. The HR Team evaluated the company’s performance management process and determined that a key ingredient for success would be integrating ‘Emotional Intelligence (EI)’ into the leadership culture. Application of the company’s competencies to be stronger as a learning organization. Development of a ‘Manager – Coach Perspective’ for Individual Development Plan. If the company is going to take up a project which can serve the above two goals, what strategy they should follow? Does Emotional Intelligence Affects Individual Performance? 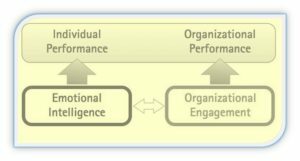 Does Emotional Intelligence Affects Organizational Engagement? Does Organizational Engagement Impact Organizational Performance? Each of the above three macro areas and each of the above eight competencies are required to be assessed and further learning interventions are required to be implemented basis the result of the assessment. External consultancy can be hired for this purpose if appropriate internal resource is not available. Organizational Engagement: This can be measured with Organizational Vital Sign (OVS), a statistically reliable research process to pinpoint areas assisting and interfering with growth and bottom line success. Trust: People are needed to have a sense of safety and assurance to take risks, by going beyond their comfort zones. That’s how innovation and sharing take place. Motivation: People need to feel energized and committed to do more than the minimum requirement. Change: Employees and the institution are adaptable with the ever changing external scenario to keep pace with. Teamwork: People are willing to collaborate and communicate effectively through formal as well as informal group creation, to take on challenges and to deliver results. Execution: Individuals are both focused and accountable. The OVS is a validated measure normed by numerous organizations across the geography. An additional scale of OVS is in the measure of engagement, which represents an overall score of all five factors. “Engagement Index” is a cumulative OVS benchmark based on the ratio of actively engaged (fully committed) vs normal vs disengaged (non-committed) employees. 3. Performance: Organization’s internal performance management data can be used to assess ‘Performance’. The evaluation process is to be sub-divided into competencies (the ‘how’ part) and the result itself (the ‘what’ part), thus giving a quantitative performance score. It includes non-quantifiable, subjective aspects. It allows to examine performance in a more complete way. It introduces medium term elements. It gives scopes for staff development program and to improve future behavior. It assures more objectivity and based on measurable elements. Defines ‘Benchmark’ for expected performance through a continuous evaluation. Evaluates the impact on business final results. A governance board for review and monitoring with key business professionals to be established to supervise the progress of entire procedure, communicate the priorities of the business and help inculcating the culture of innovation and collaboration. As it is an organizational strategic change program, the organization need to have a long term vision clearly defined. An appropriate ‘Mission Statement’ to be adopted which emphasizes on being innovative and competitive by investing in people and develop the employees, which in turn will further boost the overall growth of the organization. Identification of all the stake-holders incl. employees to be done in detail. After identification, a proper categorization of all the stake holders are to be carried out; also to enlist their expectations, deliverable, concerns, fears, risks, opportunities, threats etc. This exercise will help to identify priorities for them with required time lines. Basis the above activities, a benefit (both tangible n intangible and financial vs. non-financial outcome based) vis-à-vis resource analysis to be carried out. A Road-map with priorities and respective timelines to be established. Formulating a program to develop Managerial Intelligence either through internal resource or through external expertise. It would be a blended procedure consists of classroom training, distance learning, outdoor training, individual coaching, behavioral counseling and finally assessment, through project assignment and observation. It is also to be recommended to find out the key differentiators which may be the enablers for sustained competitive advantage. These may include focus areas for business viz. innovation & people development. A level specific competency framework may be formulated considering the strategic & tactical goals. This framework will act as a guiding tool for LnD need identification. Accordingly, the gaps can be bridged by selecting appropriate intervention as mentioned before. Role card for each position needs to be framed with defined objectives. And, from the role cards, individual goals are to be set with defined timelines to achieve short term targets (1 yr. to 2 yr.) and long term targets (up to 5 yrs.). Jayathi you are a genious..
a Super practical writer. Extremely well written. Thank you Madam , for your encouraging words ! Thank you Madam, for your encouraging words ! Thank you so much for sharing your great thoughts.